In her review of The Life and Times of Barbara Stanwyck: Steel-True 1907-1940 for The Chicago Tribune, Liz Smith is somewhat astounded at the length of Virginia Wilson’s book, issuing the withering criticism, “She was a great actress, but not Winston Churchill.”  This is not really a fair place to start. Why is it assumed that people should write long books only about politicians? That said, Smith still claims to be eagerly awaiting the second volume of Wilson’s biography – as am I. In any case, this is a book that has been anticipated by so many, because it is not so much about Stanwyck as an actress, but Stanwyck as a woman. In something of a profile of Wilson written in 2006 – that observes Stanwyck paraphernalia around her home and some historical material kept in a fireproof gun safe – she is quoted as proudly declaring, “I have to protect my Stanwyck stuff.”  Wilson’s own life is directly connected with the glamorous Hollywood era, as she had Stella Adler as a stepmother. Quoting an unspecified source, Wilson describes her subject as “one of the mysteries of Hollywood; more mysterious in her way than Garbo” (292). Garbo may have gained mythological status with her disinclination to share public life, but was Stanwyck the same? There is so much about her life as a woman that has been kept private, unrecorded by herself, her friends, and her colleagues. Here, some of it is bared. A lot of material is covered in Steel-True – not simply an overview or a speculative narrative, as has been done in the past, but a strong presentation of intricacies of personal and professional life. Wilson’s research draws out comments from her close friends and family members, relaying accounts of how hard Stanwyck and her friends worked, and paints a picture of her theatrical life, involved with multiple theatres and having to sometimes perform two shows a night. Mae Clarke, her friend and roommate (and later Hollywood contemporary), said of herself, Stanwyck and another friend, Dorothy Shepherd, “We were harum-scarum kids, mad-caps who did crazy things but I never knew Ruby to do an unrefined thing” (62). Wilson paints a vivid picture of those early days of Ruby Stevens’ life as a dancer, with the odd cameo by others who became Hollywood royalty — most notably Joan Crawford, known in her New York days as Lucille “Billie” LeSueur. She and Stanwyck would later become close friends in Hollywood. And yet, while the content is engaging, it’s not always an easy read. Wilson’s writing can be repetitive, as though written to be kept as an index of Stanwyck’s life, not read the whole way through. (So it will be a good book for the personal reference library.) But, on top of the repetition, some of the writing is extraordinarily dry, and even flaccid. It can be clunky and poorly edited; Wilson can compose two sentences in a row that contain identical information, repeat things on the same page, or repeat information chapters later with no further insight. And I lost count of the number of times Wilson informed her readers that Byron Stevens was “Barbara’s brother.” The holes in its literary fluency are rather disappointing. In addition, there are certain things that aren’t expanded, and their inclusion in brief makes for unsatisfying reading. In her attempt to be thorough, she includes information that really shouldn’t be there, or at least could have been moved to a section of notes. For example, after details of her sister Mabel’s early death, Wilson writes, “Barbara somehow got around her deep feelings of grief and showed a new ease and confidence in her work in Illicit” (185). Somehow? How? Why write such a sentence? She writes that Stanwyck’s nephew Al “had worked for Barbara and Fay’s decorator until he was fired” (358). In what circumstances? Later, Wilson mentions that Barbara’s hair stylist Hollis Barnes and her husband were alcoholics, like Fay. But the next sentence simply confirms that Hollis became Barbara’s friend and companion (452). Why from one point to the other? In the following page, she mentions a note of apology written by Katharine Hepburn to Barbara, during the filming of Annie Oakley in 1935. What was Barbara’s response to this? It isn’t mentioned, and the text simply moves on. I love that I now know this about Hepburn, and about Barbara. As someone interested in Stanwyck’s life, and in the broader history, culture and structure of Hollywood in the early studio days, it’s hard for me to suggest these inclusions are a negative. But they are not given the discussion or space enough to honour them. The gaps are unavoidable, perhaps — but they are unsatisfying. When Wilson inserts her opinions into this book, she does so all too briefly. She declares Golden Boy an important picture, one in which William Holden gives a fine performance, but one in which Stanwyck is drained of all her lightness and vitality. She is, so to speak, simply playing a part as it is scripted. Wilson barely spends a hundred words on this theme; it needed more. Her approach to Stella Dallas is an odd one, where she seems to admire the film but also dismisses it, suggesting that it is inconsistent, although sometimes wonderful. She skips from the novel, to the play, to the silent adaptation, to Vidor’s film, covering some aspects of each, but not all. It is hard to tell what her final stand on them is, and I want to know more. Despite its patchiness, Steel-True is a notable addition to the canon of writing about Barbara Stanwyck. The detailing of the history behind A Star Is Born and its being modelled on Stanwyck’s deleterious marriage to Fay is one of the more interesting segments of the book, as is Wilson’s collecting of all the other relationships and people whose unfortunate lives had influence on Selznick’s creation of the picture. The lives of John Barrymore, John Gilbert and Virginia Bruce, Colleen Moore and John McCormick, each were considered as models for the picture. Additionally, the detail given about the court case between her and Frank Fay over the custody of their son Dion is fascinating. Wilson ends her first biography with a nuanced discussion of Remember the Night, one of my favourite Stanwyck films and, I think, one of Wilson’s, too. She gives a great analysis of its brilliance, detailing the complexities of Preston Sturges’ script and Mitchell Leisen’s direction that really allowed Stanwyck to reach her best. “Barbara never looked more beautiful, more luminous, than she does in Remember the Night” (821). For me, at least, this was a good place to end, with Wilson exuding warmth towards her subject. In a way, this biography says far too much but not nearly enough. In the introduction to the new volume released by Knopf (where Wilson is a publishing executive) of Elia Kazan’s letters, the editors write, Kazan is “a mature writer [who] recalls the tumultuous events of six decades, determined to explain his overflowing life in stark detail and at the same time meet the formalizing needs of a far-ranging chronicle.”  Perhaps Wilson’s biography doesn’t quite work as a book, on the whole, but its encyclopedic scope is more than impressive, and even a brief glance at the index betrays the insight into Stanwyck’s life on offer. 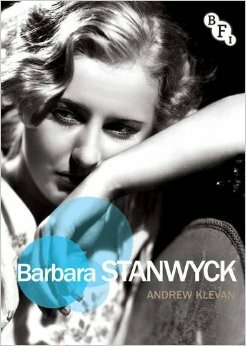 Andrew Klevan’s analysis of Barbara Stanwyck’s acting and onscreen presence is an altogether different type of book. Klevan explores the actor’s screen presence and not the life behind it – but the difference in their command of writing is immediately apparent. His writing is adoring of Stanwyck and all that she achieves on screen, all that she has given us as her audience. He confronts his subject with a detailed, descriptive attention to brief moments, confining his work and analysis within a slenderer margin than Wilson addresses. This is not unexpected; Klevan’s past work is contained, focused, across a number of significant articles, book chapters, and the excellent addition to the Wallflower Press Short Cuts series, Film Performance: From Achievement to Appreciation (2005). At one point in his book, simply titled Barbara Stanwyck, he turns to Stanley Cavell’s writing on her career and her becoming as a star, and observes in the final moment of Stella Dallas that “a delighted Barbara Stanwyck is revealing herself” (56). And she was, delighted for the turning point in her career as she approached a decade’s worth of working in film. As with Cavell’s writing, this book appreciates as well as adores. Klevan draws on a veritable fortune of film analysis, from Elisabeth Bronfen, V. F. Perkins, James Naremore, and Richard Dyer. He includes Dyer’s comment from Stars, “All stars are in one way or another exceptional, just as they are all ordinary.”  She is rather ordinary, concludes Klevan, particularly when compared to “the rarified qualities of Garbo et al.” (24). Yet with their works, Klevan and Wilson are elevating Stanwyck’s position, recognising that her qualities may be just as ineffable and charismatic as those other stars, and giving her the space to be revered. After a brief discussion of some of her early, and important, films, Ladies of Leisure (1930), The Miracle Woman (1931), and Night Nurse (1931), Klevan dedicates a significant part of the book to a close analysis of her most enduring: individual chapters on Stella Dallas (King Vidor, 1937), The Lady Eve (Preston Sturges, 1941) and Ball of Fire (Howard Hawks, 1941), Double Indemnity (Billy Wilder, 1944), and her two films with Douglas Sirk, All I Desire (1953) and There’s Always Tomorrow (1956). At first, this seems not the best use of space for a book, as there is so much already published about these films. In a recent article about Stella Dallas, Jonathan Frome wonders, “Why choose this film, one of the most frequently discussed melodramas in film studies … it might seem that everything worth mentioning about Stella Dallas has already been said.”  Klevan’s approach to his subject matter is so specific in detail that it is definitely a worthwhile addition to the study of the film. So much so that his writing on Stella Dallas has inspired an audiovisual essay by Catherine Grant, titled Magnifying Mirror. Grant uses Klevan’s focus and text to illustrate his analysis with sections from the film. This work done by Grant highlights the tender nature of Klevan’s film and performance analysis, in which he constructs his approach with the same care that Stanwyck gave her own performances. Klevan suggests that, rather than show off her body or femininity, as other actors did, Stanwyck “is too busy exploring the subtlety of interactions” (24), and she “nuances matters of sincerity” (117), which makes her a particularly intriguing subject to study closely. In his final chapter on the Sirk double, titled ‘Stillness’, Klevan explores beyond the default “subversive” nature of the director’s melodramas, searching instead for the distinctive qualities that the actress brought to Sirk’s films. Klevan’s striking title for this chapter comes from a comment made by Sirk himself: “there is such an amazing tragic stillness about her” (111). This is evident in other roles – Klevan admires Stanwyck’s minimalism and, in Double Indemnity, she uses her skill in this manner to make her character of Phyllis difficult to read. It is surprising, he says, that Phyllis has been interpreted so transparently — as the villain, femme fatale, of the piece (93). This is an interesting point, and not one I necessarily agree with — nor do I necessarily agree that she is not determined or in control of her actions. But there is such immense sadness within her character that has rarely been written about before, and Klevan does it here. How do we tell who the woman was, beneath and beyond her film performances? As identified by so much previously written about her, and by Wilson’s book, Stanwyck protected a lot of herself, and there’s no reason why she shouldn’t have. Steel-True makes inroads into her life but, in Wilson’s writing of her research material, the book still implies that there is much that cannot be told. But, of course, she left us with an extraordinary career’s worth of performances, and at least we have those. Liz Smith, ‘The big, big book on the big, big legend, Miss Barbara Stanwyck’, The Chicago Tribune, December 18 2013, online: [http://www.chicagotribune.com/entertainment/sns-201312171600–tms–lizsmittr–x-a20131218-20131218,0,7996980.story]. Accessed April 24, 2014. Cathleen Medwick, ‘Visions and Revisions: An Editor’s Dream’, The New York Times, October 27 2006, online: [http://www.nytimes.com/2006/10/27/realestate/27away.html?pagewanted=all&_r=0]. Accessed July 26, 2014. Albert J Devlin and Marlene J Devlin, The Selected Letters of Elia Kazan, eds. Albert J Devlin and Marlene J Devlin, Alfred A. Knopf: USA, xiv-xv. In his book Stars, from which this quote is taken, Dyer writes, “It’s worth remembering too that other independent women stars – Barbara Stanwyck, Ann Sheridan, Claire Trevor – do not carry upper-class or intellectual associations (58). Jonathan Frome, ‘Melodrama and the Psychology of Tears’, Projections, v8n1, Summer 2014, 23-40. Catherine Grant, Magnifying Mirror, http://filmstudiesforfree.blogspot.com.au/2013/11/magnifying-mirror-on-barbara-stanwyck.html. Accessed November 13, 2013.